Bohol offers a wide assortment of ecological and cultural points of interest. The existing major tourist attractions range from the geological to the historical, natural and religious, making Bohol a magnet for those wishing to invest in the tourism business. its tourism pillars; the Chocolate Hills (a National Geological Monument, the province’s signature attraction); its white-sand beach areas of Panglao Island, dive spots in Balicasag and Cabilao Islands where one can marvel at the colorful and exotic display of marine life; the Philippine Tarsier (one of the smallest living primate and oldest land Species in continuous existence in the Philippines belonging to the primitive sub-order Prosimii datinf around 45 million years); its heritage structure of coralline stone erected during the Spanish era that include churches, convents, watchtowers, escuelas de niños fascinating culture and history rich in texture and y niñas , cabildo and presidencias; and Bohol’s topography, dynamic arts and cultural traditions worth to treasure. The province identified nine (9) priority sub-sectors for commercial production, namely: cereal, mango, coconut, tree enterprise, cut flower, rootcrops, vegetables, livestocks and acquacultur. Particular areas for investment are high-value crop production, setting-up of post-harvest facilities, feed mill and fruit/fishing of fresh water species culture (in selected/limlited sites) and processing. Manufacturing ventures will be largely agri-based utilizing abundant raw materials in the area’ i.e. , processing of fish, meat, prawn, banana, rootcrops and mangoes. About 120,000 mango trees are currently fruit-bearing with another 80,000 trees yielding in 3 to 4 years. Bohol is also a leading seaweed producer in the country, a top supplier of carageenan, a gelling agentuse extensively as thickener or emulsifier in almost every commercial products from medicine, toothpaste, ice cream, chocolate, cosmetics and even beer. The northern corridor of Bohol is identified as the zone for industrial development in the province. The province has seen the establishment of special Economic Zones as a critical to the generation of investments in light manufacturing and agro-industries. 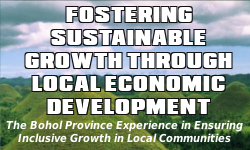 About 550 hectares is proposed for industrial estate development in 6 municipalities in the Second district of Bohol. In the northwest corridor of the province, 3 initial industrial estate sites are identified covering 3 municipalities. Presently, there is one tourism estate, thePanglao Island Tourism Estate (PITE) in bohol covering a total of 2 thousand hectares.